From November 8 to 18, 2018, Venezuela was the vibrant scene of the Fourteenth International Book Fair (FILVEN) that took place in the historic center of the city of Caracas. Bolívar Square, one of the most important and recognized public spaces in Venezuela, was decorated with shelves and displays of books from all over the world. The featured country this year was Turkey. Special tribute was also paid to the Venezuelan poet Ana Enriqueta Terán, as well as to the newspaper Correo del Orinoco which was founded by Simón Bolívar in 1818. During the fair there were 111 exhibitions with more than 565 activities including book presentations, awards and tributes, a children’s pavilion, forums, conversations and meetings, workshops, poetry recitals and artistic performances. I had the honor of being invited to participate in FILVEN along with a group of writers, authors, editors and representatives of social movements. I am not oblivious to what is happening in Venezuela, I read daily what the alternative and corporate media publish. And I communicate with friends who live there through social networks. Having stayed in the country for only four days, I don’t pretend in any way to be an expert on the situation in Venezuela. But I do feel the need to write some personal observations and share what I could see in that short time. The corporate media brazenly lies about Venezuela. If you let yourself be carried away by what you read or hear in the corporate media you would think that people are starving, that the country is empty because so many people have left, and that violence is prevalent. That’s not what I saw. Let me begin by saying that Venezuela is an extremely hospitable country, and Venezuelans are a cheerful people who enjoy themselves in spite of the difficulties. For his part, Venezuelan Minister of Culture, Ernesto Villegas, explained that the fair included an exhibition on the waves of migrants that Venezuela has received throughout its history. I would be lying if I said that I saw a single person sleeping in the streets of Caracas like what I see every single day a few blocks from where I live in the city of Oakland, California. Here there are thousands living under the bridges of the great highways in the richest country in the world. On the contrary, on my way from the Maiquetía Simón Bolívar International Airport to the city I was able to see with my own eyes the big housing projects which are part of the Misión Vivienda. Called repressive by the US media, Venezuela began to emphasize housing of the people with the Hugo Chávez government and continues to do so under President Maduro, with another two million housing units created for low-income people. Venezuela gets the label “repressive” because it is guilty of being a good example. In addition to speaking in two workshops I participated in several book presentations, all very well attended, where most of the attendees were Venezuelans, who asked questions and expressed their opinions, proud that their country gave them that freedom. 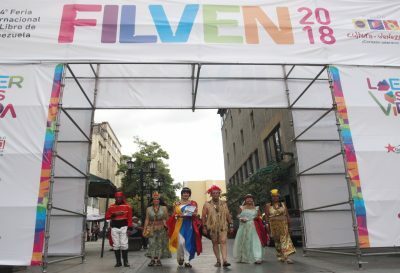 I have no doubt that FILVEN is an important people’s event organized by and for the Venezuelan people. During the weekend the fair was busier with families and especially many children. 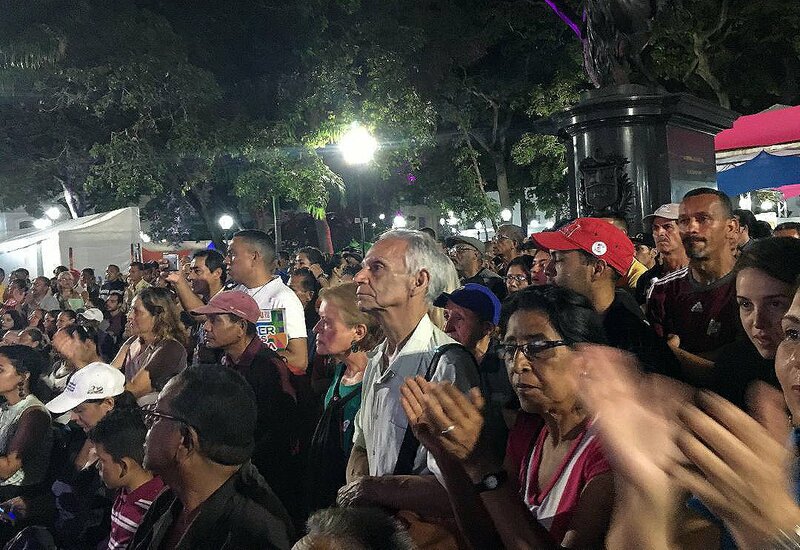 On Sunday afternoon I witnessed a public cultural event full of people in the Plaza Bolívar that also touched my heart. It was an event to commemorate the life of Alí Primera, who would have been 77 years old this year. Primera was a musician, singer, composer, poet and political activist. He was and continues to be “The Singer of the Venezuelan People.” His nephew Alí Alejandro Primera, current president of the National Music Center (part of the Ministry of Culture) was in charge of the tribute, and there were also Sol Musset, singer and wife and mother of four of his children, and the renowned singer-songwriter Lilia Vera. Many years have passed since Alí Primera’s departure in 1985, but Alí’s songs continue to reflect the uncertain future in which we live, with the advent of new right-wing governments on the continent. Being part of that cultural event fills me with joy and emotion, especially seeing so many people enjoying themselves, and singing in chorus the songs of this humble man who left his voice and the heartfelt lyrics of his songs to his people. What was clear to me is that the FILVEN represents the will of a government under attack that despite the adverse conditions is able to organize a book fair, with few resources, so that the entire population could benefit by being able to access all this culture. Venezuela is the victim of an all-out blockade that began with an executive order from Obama when he declared Venezuela a threat to U.S. national security. The order continues under Trump but he has taken it further by implementing a blockade that affects the daily lives of all Venezuelans. In addition to the blockade, Venezuela is a victim of terrorist acts such as the one that occurred on November 4, when three members of Venezuela’s Bolivarian National Guard died after a confrontation with Colombian paramilitary groups in the border state of Amazonas. There are governments who lack the will to educate their people and seem to do everything to do just the opposite, content to have a population lacking in critical thinking. Perhaps that is why there is not a Department of Culture in the United States. If there is one thing I brought back with me besides the hugs, the warmth and hospitality of the Venezuelan people is that VENEZUELA WANTS TO LIVE IN PEACE. Alicia Jrapko is a co-editor of Resumen Latinoamericano, US bureau, a co-chair of the National Network on Cuba and the US coordinator of the International Committee for Peace, Justice and Dignity.